This team effort by architects, engineers, artists, and the city’s administration represents the culmination of a total of 15 years planning and construction work in Düsseldorf. It all started in 2001 with a two-stage EU-wide competition for an overall concept which was won by Darmstadt-based netzwerkarchitekten in collaboration with Berlin artist Heike Klussmann. During the submissions stage, technical advice was provided by Dr. Alexander Hentschel (structural engineering), as well as by Andrew Holmes (lighting design). Crucial to the jury’s decision at the time was that the proposal envisaged maintaining an overall identity for the line, while allowing for diversity in the design of individual stations. In addressing precisely this ambiguity in the subway design, the team had come up with a conceptually powerful and coherent response. Two abstract terms play a key role in this design: the continuum and the interstices. The continuum comprises the entire tunnel construction, including the stations along the line, which are essentially regarded as being a 'widening out' of the tunnel section. 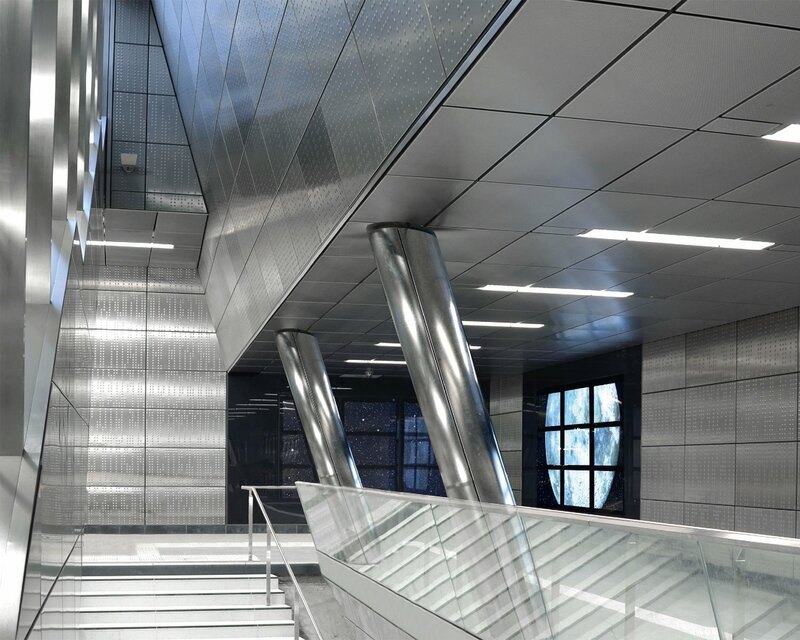 The uniform wall cladding used in all the station interiors – precast concrete panels with a relief pattern – transposes this concept of a spatial continuum into a recognizable and unifying image. By contrast, the interstices connect the respective subway stations with the urban fabric at street level. It is these zones that accommodate the access routes, stairs, escalators, elevators and concourses. As early as the competition stage, the aim was to open up sightlines to create a direct visual connection between each station and the city, and, whenever possible, to bring daylight right down to track level. These long views not only facilitate passenger orientation but also engender a greater sense of security, while simultaneously countering the feeling of being in a confined space. The connecting interstices vary greatly in geometry, depending, on one hand, on the architectural disposition of the urban space at street level, and on the other, on the layout of the station below ground. For this reason, these interstices were identified as the venue of station-specific artistic interventions. Right from the outset of the competition the foundations has thus been laid to ensure that rather than a heterogeneous collection of stations, each designed by a separate team of architects and artists, the Wehrhahn Line would be able to incorporate artists to work on station designs within the overarching unifying concept innate in the winning proposal. For the subsequent art competition, a list of artists was put forward by representatives of Düsseldorf’s cultural institutions, namely the Kunsthalle, the Kunstverein, and the Museum Kunstpalast, as well as by the Municipal Dept. of Culture. Alongside representatives of the latter and of the Dept. of Traffic Management, the jury included members of cultural institutions as well as architects, including netzwerkarchiteken. At the initial stage, 16 artists were invited to participate. They first had to formulate a basic concept, and then, at a second stage, explore this further in relation to specific interstices, working in tandem with the architects. 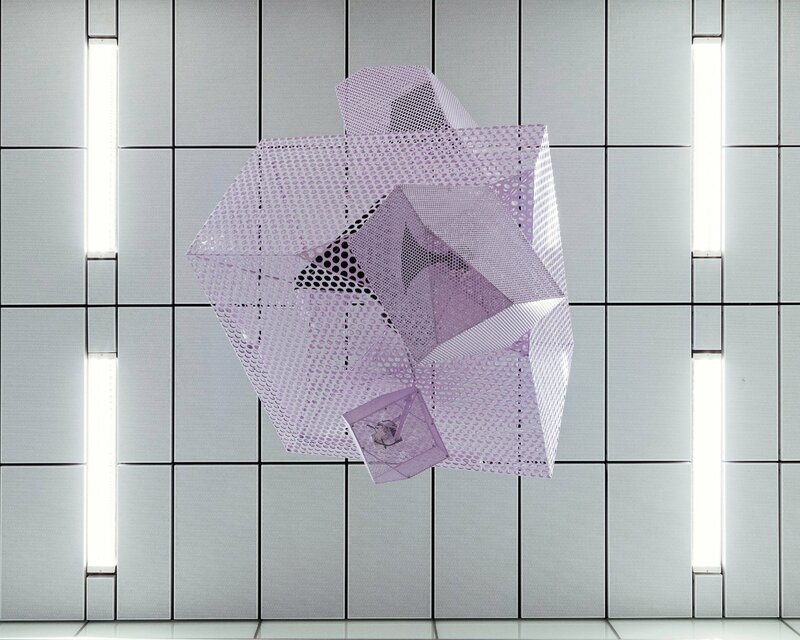 The aim was to select a further five artists in addition to Heike Klussmann who from then on would each advance his or her ideas for particular interstices in collaboration with the architects. The jury selected Enne Haehnle (Kirchplatz), Manuel Franke (Graf Adolf Platz), Thomas Stricker (Benrather Strasse), Ralf Brög (Heinrich Heine Allee) and Ursula Damm (Schadowstrasse). For the interstice at Pempelforter Strasse station, Heike Klussmann elaborated a concept she had presented at the architectural competition stage. Heike Klussmann was also responsible for fleshing out the artistic concept for the continuum that she had already presented in the architectural competition. The assignment, as well as the later project realization both bear strong testimony to the fundamental and unique concept of the Wehrhahn Line – namely integrating urban space, engineering work, architecture and art in dialog with one another. The choice of a precast concrete cladding system for the station walls, for instance, derives from translating the reinforced concrete prefabricated sectional elements used in tunnel construction into another medium. 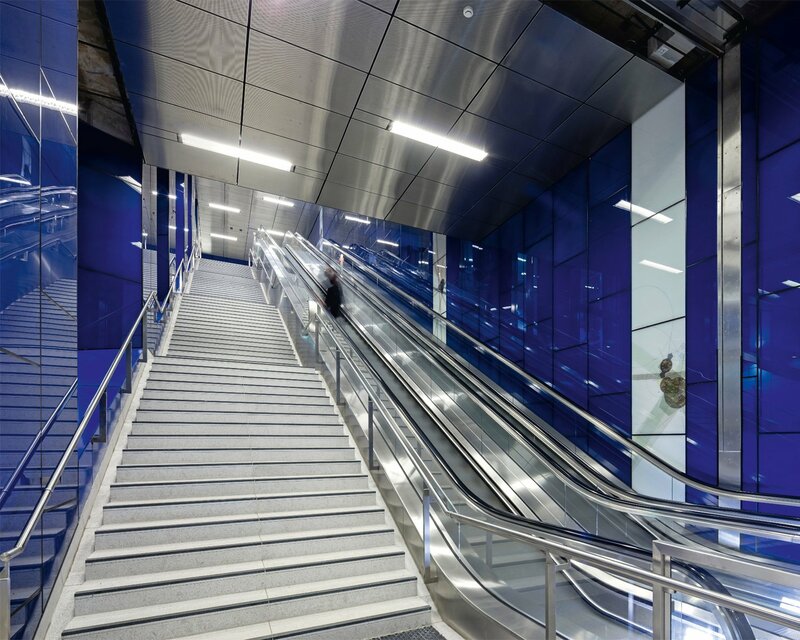 The cladding’s geometric structure – based on a stretched and compressed diamond – is reminiscent of snakeskin, and thus by association, it echoes the long, winding tunnel. 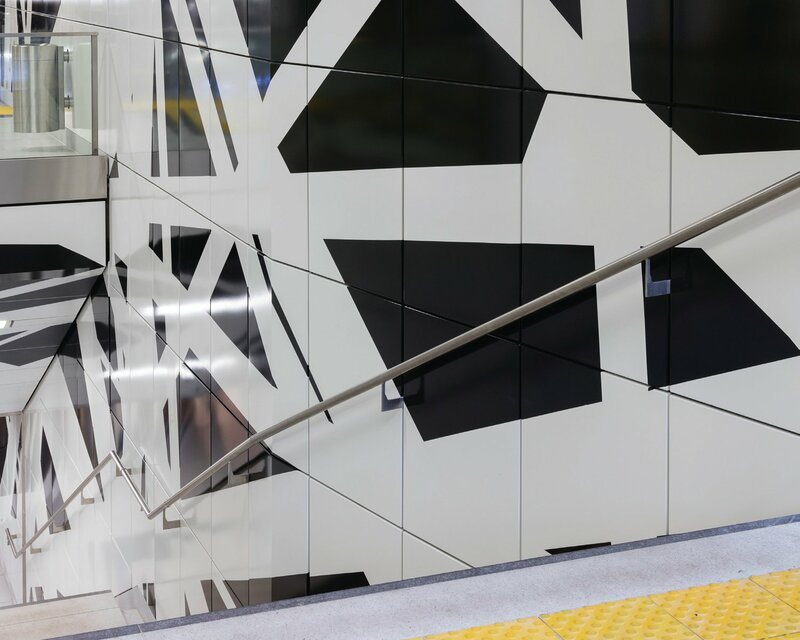 At the same time, the cladding’s segmentation, which blends with the respective graphics to form a unity, means that individual elements can be replaced or repaired – a core requirement in subway construction. Technical regulations also had to be met, which called for example for fireproof and vandal-proof panels. Further thought went into how the individual panels should be joined, and how they might intersect with adjacent areas, as well as the economic feasibility of producing such a raft of different formats. Here art is not simply an applied layer, but an integral part of the building, so these components were included as an element in the construction tender for the architectural outfitting. Likewise, throughout the planning and implementation of the project, there was constant, intense collaboration between the engineers, architects and artists. The same, in essence, is true of all the artistic interventions in the interstices. They intervene in the space, impact on it such that the artistic concept has a direct bearing not just on the specific architecture but on its structural elements too. The interventions effectively occupy the entire interstice in question. They are not simply installed in the space, but fundamentally characterize it to the extent that the boundaries of art and architecture merge. Each of the routes leading from the urban world above the ground down into the subway station beneath has its own unique and unmistakable identity – owing to the different contexts, the different spatial geometries and, above all, the different artistic concepts evolved. At Heinrich Heine Allee station, Ralf Brög designed three scenarios – ‘theater’, ‘laboratory’ and ‘auditorium’. Each emits alternating acoustic impulses and sound bites. Ursula Damm developed a multipartite interactive installation for Schadowstrasse station. 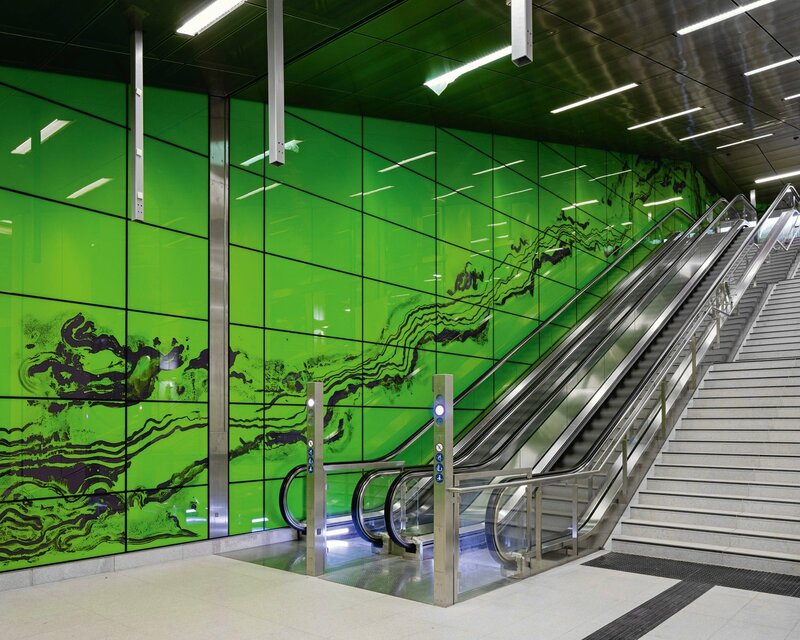 At Graf Adolf Platz, Manuel Franke created a walk-in colored space with hundreds of bright green glass panels, interrupted by a flowing stream of lines. At Kirchplatz, Enne Haehnle wrote poetic texts for her station, which she then transformed into a sculptural element. 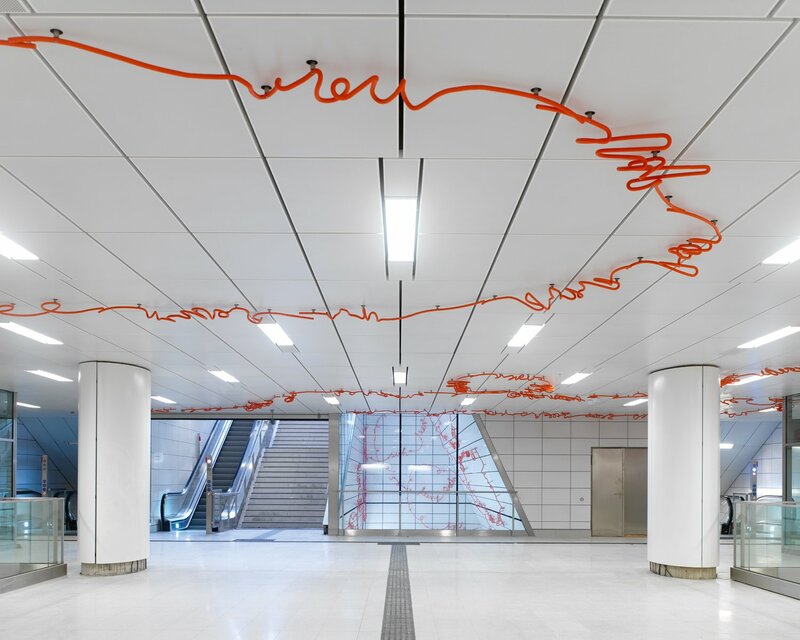 Heike Klussmann’s design employs white ribbons on the walls of the corridors, which run over the ceiling and the floor of the station, halting or unravelling, depending on the architectural geometry. At Benrather Strasse station, Thomas Stricker brings the universe with its planets and stars, its calm and zero gravity into the underworld of the subway station in a concept that effectively inverts the surrounding architectural space. What unites all these works is an awareness that they are directed not at an art-loving public in an exhibition gallery, but at people who are constantly on the move. Even so, such all-embracing and holistically designed spaces slow down the pace and generate calm. The absence of advertising also helps as the new subway stations are entirely devoid of posters, ad display cases and commercial outlets. Architecture and art can inextricably combine, such that they respond to each other in a process of cross-fertilization and mutual enhancement. Together, they can influence how we experience space.